Boca Raton, FL – Medical costs are currently about 60% of all workers compensation benefit costs in the United States. Medical costs in the system had a watershed year in 2015. 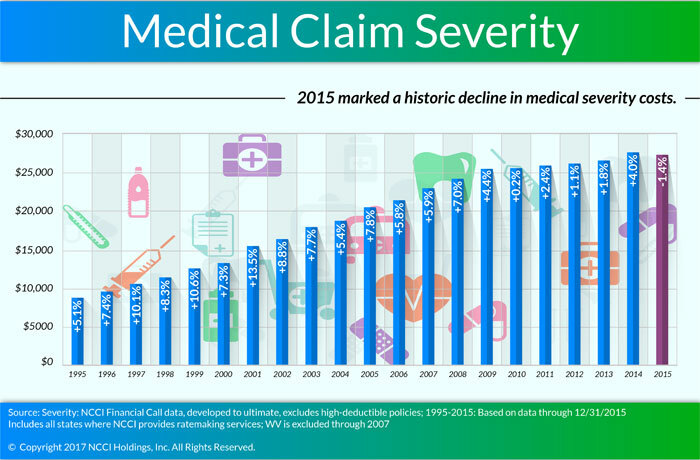 For the first time in more than 20 years, the average severity of medical claims for employees who were out of work due to injury or illness declined, after years of steady increases in severity. What did medical severity trends look like prior to 2015? In the 20-year period from 1995 to 2014, lost-time medical claims severity in workers compensation cases steadily increased, outpacing medical price inflation. Between 1995 and 2002, average annual growth in claims severity was 9%. Between 2002 and 2009, the annual growth rate in claims severity was 6%. Reversing a two-decade trend, NCCI determined that the average paid medical costs per workers compensation claim declined by about 1% in 2015. A decrease in medical severity was observed in about half of the 38 states that NCCI surveyed and occurred despite the fact that the mix of diagnosed injuries in the workers compensation system remained relatively stable between 2012 and 2015. What key factors led to the decline of medical severity costs in 2015? What about costs for hospitals and other medical services? NCCI’s analysis found that paid hospital costs per workers compensation claim increased by about 2% in 2015, while “all other” medical costs—including prescription drugs, ambulatory surgical centers, medical care commodities, and other medical services—collectively decreased by 2%. With physician services representing about 40% of all medical costs in the workers compensation system, the 3% decline in that category was the major contributor in overall medical severity costs decrease of 1% in 2015. Why is it important to understand what factors led to 2015’s declined in medical severity claims costs? Understanding the specific cost drivers in the workers compensation system—and what leads to increases or decreases in costs—is essential for individual states and for all the stakeholders in the national workers compensation system. This data can help guide decisions that ensure that injured workers receive the high-quality care they need in the most effective and efficient manner possible, and help protect the viability of the workers compensation system for future generations of workers.